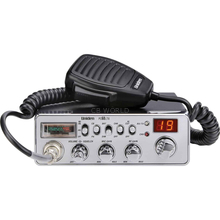 Uniden PC68LTX 40 channel Mobile CB Radio. ThePC68LTX brings back the high quality circuitry that made Uniden famous! Radio operators have been mourning the disappearance of the "high-cut" audio option from Uniden's CB Radio line up for quite some time. Now Uniden has reintroduced the high-cut audio in the PC68LTX mobile CB radios! The Uniden PC68LTX is elegantly styled and packed with the most popular 2-way radio features in a user friendly package that will be familiar to all Uniden CB fans! A bright LED channel indicator, easy to read meter, front panel mic connector, and Uniden's classic controls with an enhanced channel selector that offers more positive channel selection and reduced drift are some of highlights to the new PC68LTX. The Uniden PC68LTX includes an extra-long mic cord for operator convenience even in the largest of vehicle cabs. RF gain control, Mic gain control, PA/CB switch, Analog S/RF meter, instant access to channel 9, and a sturdy mic with left side positive push to talk make the PC68LTX loaded with the features that professional drivers have enjoyed for years! And the reintroduction of the high-cut audio switch will make any veteran driver happy while newer CB radio operators will enjoy the clarity and frequency response that Uniden's high-cut audio brings to the conversation. Size: 6.3" x 6.4" x 2.2"